Montana's Missouri River, downstream from Holter Dam, is one of the finest tail-water fisheries in the West. The relatively consistent flows and prolific insect hatches combine to make this stretch of the Missouri river one of the best fisheries anywhere. On a full day float, we stop often and work a particular stretch of water or pod of feeding trout. Our Missouri river guides offer the angler an opportunity to hook into many large fish throughout the day and the seasons. 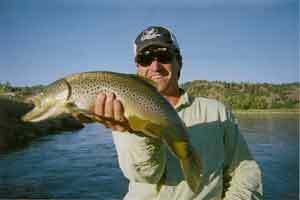 Early spring conditions (pre-runoff) make for some great streamer fishing for large Brown trout. Nymphing can also be quite productive this time of year for fly fishing in Montana. 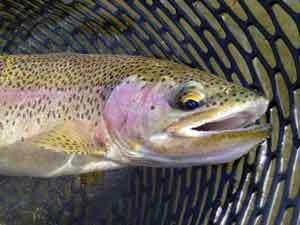 The "Mo" offers great dry fly fishing from mid summer into the fall. Fall can be the prime fishing time on the Missouri. The river traffic slows down and many big fish come to hopper imitations. The Baetis and caddis continue to hatch and make for spectacular fly fishing on the Missouri river.